The first two Adobe Acrobat files summarize the data collected and analyzed from the sources listed below. The maps allow you to visual the data. Map with address and build date A large map. Make sure you are zoomed in for detail. Map with color coded build dates Also a large map. Make sure you are zoomed in for detail. The following resources are available for determining an approximate build date for a particular house in our neighborhood. 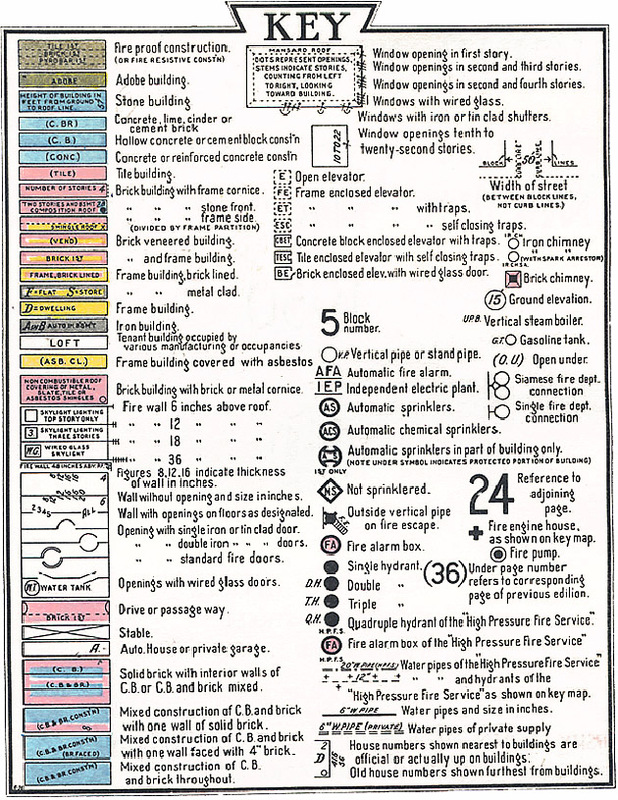 Note that there may be more than one plat of a portion of a subdivision on the displayed page. This information is from the Hillsborough County Clerk of the Circuit Court's records. From the July 8, 1913 Tampa Tribune, we have a list of properties in the city grouped by subdivision and identified by subdivision block and lot where it is indicated who owned the lot, the value of the lot and, importantly for our purpose, the value of any structure on the lot. 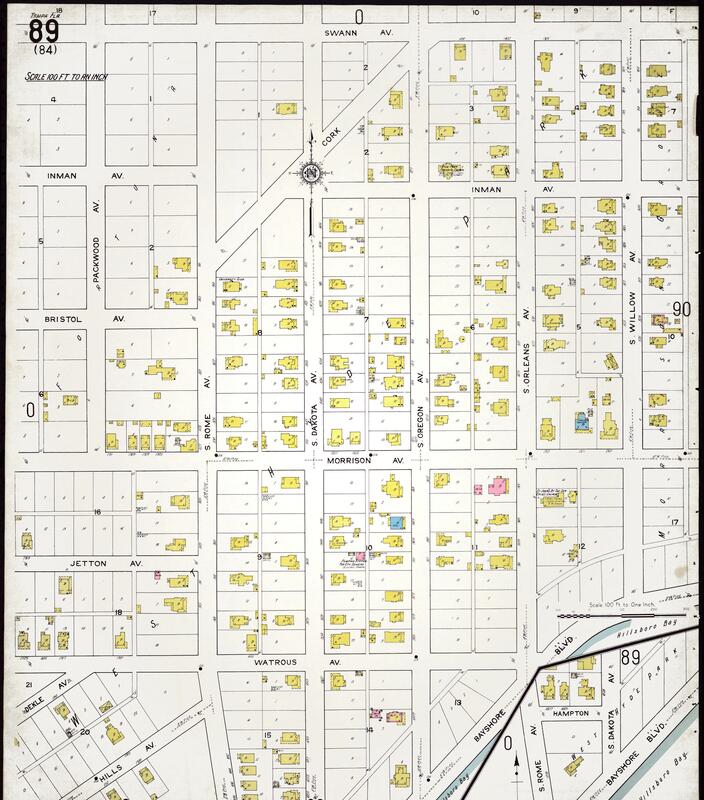 The links below are to the three pages of the 1913 Tax Roll that contain our two subdivisions, West Hyde Park and Morrison Grove. 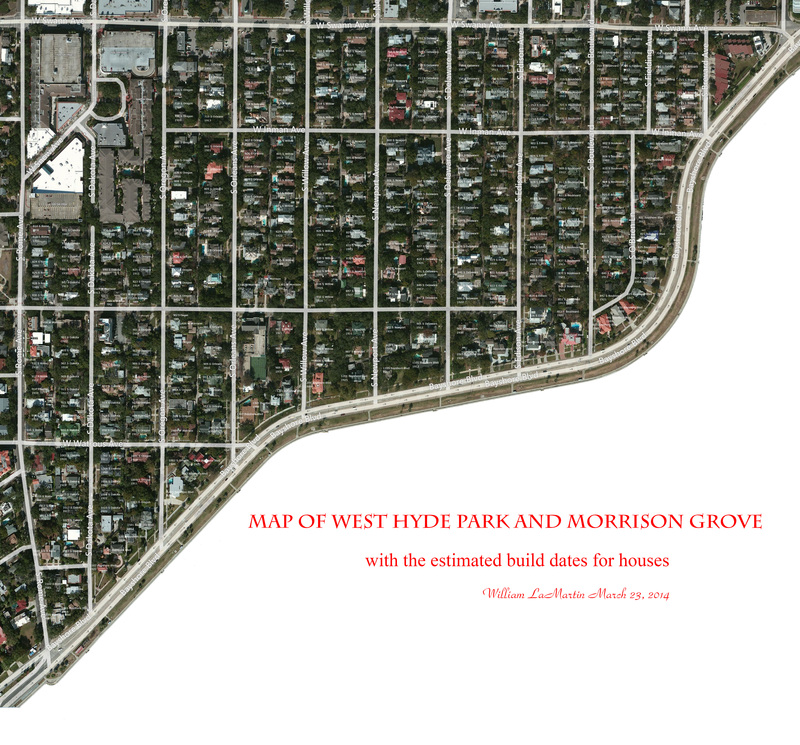 On the first page, you will find the West Hyde Park subdivision which is then continued onto page two. Further along on page two, you will find Morrison Grove (the part in section 26). 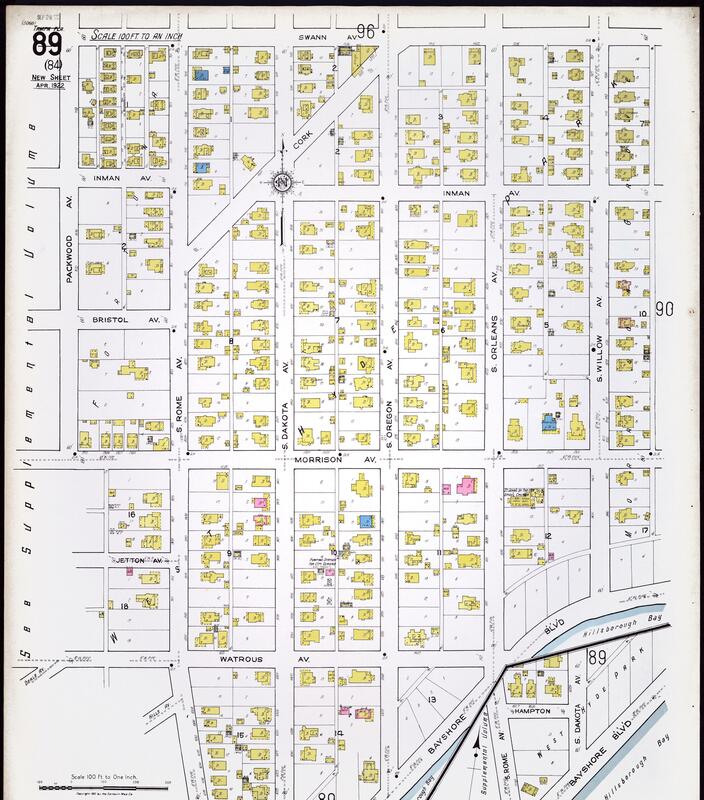 Then on the third page you will find the part of Morrison Grove that runs from the east side of S Boulevard to the bay containing Fielding, Brevard and the part of Bayshore between Inman and Boulevard (the part in section 25). 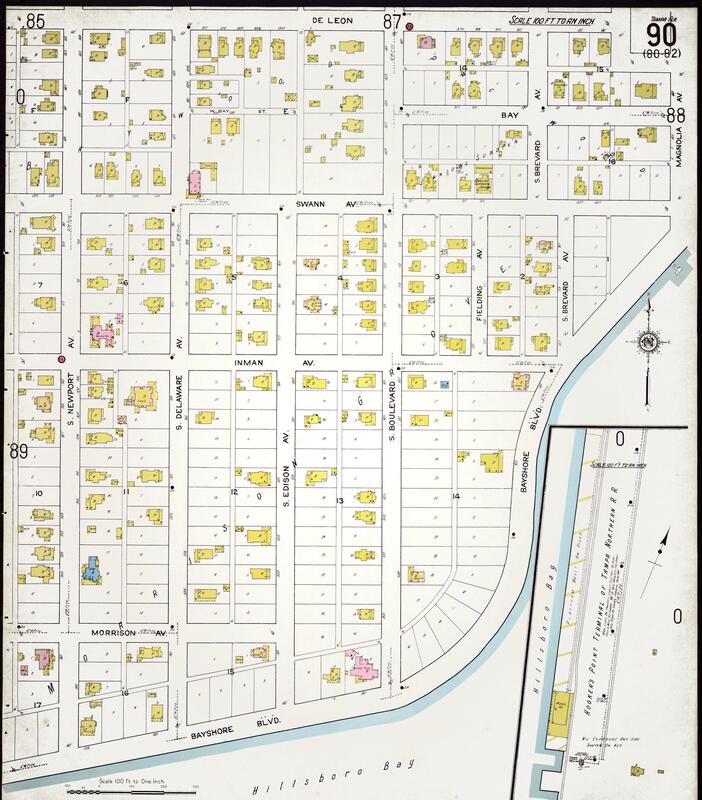 Sanborn Fire Insurance Maps of Hyde Park (really Morrison Grove and West Hyde Park). 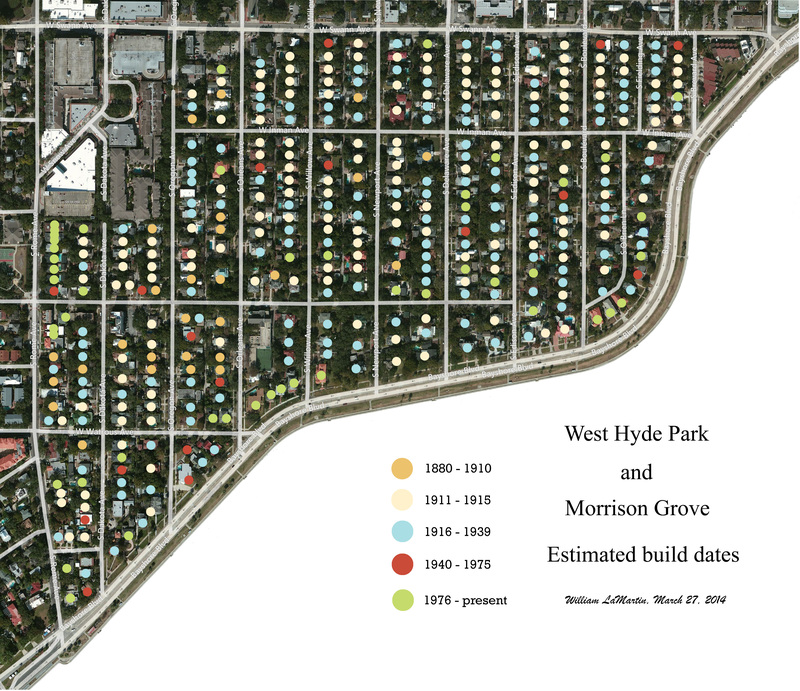 These maps show the individual structures existent in 1915 and 1922. These are large images, about 2860 pixels x 3250 pixels. So you will have to scroll your browser window if you are to see the entire map at its true size. If the entire map fits on your screen, then you are not viewing it at full size. You should be able to click your mouse on the map to make it enlarge to full size. Warning: A few of the house numbers do not match the present house numbers. For example 823 may now be 825, etc. 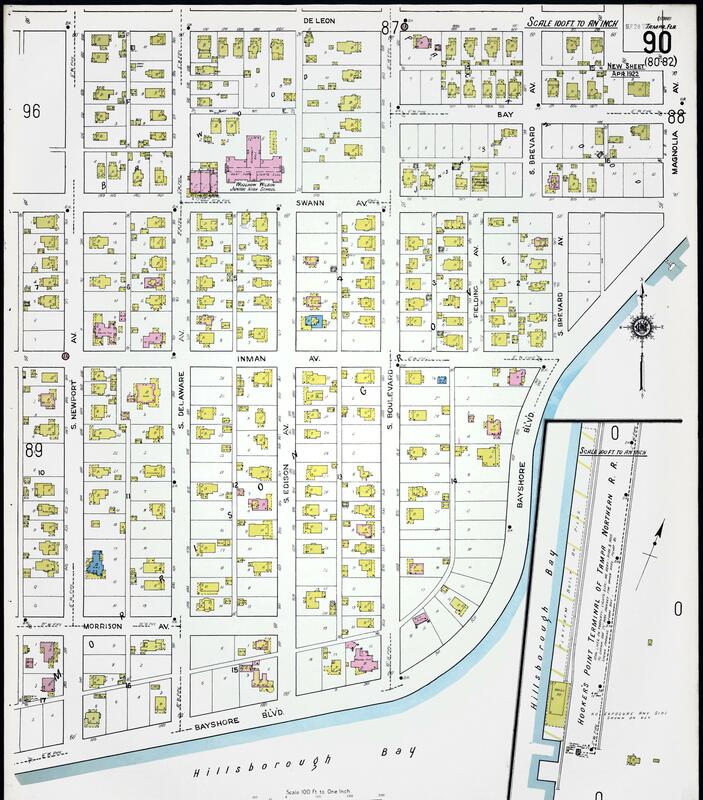 1915 and 1922 Sanborn maps overlaid on the current map. This application requires that the Microsoft Silverlight plug-in be installed in your browser. It is a free download from Microsoft and you will be prompted to do the download if needed. These files are partial City Directories in that they contain only the street listing of residents and not the alphabetical listing. The complete digital version of these R. L. Polk & Co. Tampa City Directories may be found in the Florida Heritage Collection of the University of Florida, http://palmm.fcla.edu/fh/. Some of these Adobe Acrobat files were quite large. However, by both optimizing them and performing optical character recognition (OCR) on them, they have been reduced in size considerably and are thus more easily downloaded. however, due to the quality of the original images, the OCR was far from complete. Be warned, though, that some old house numbers do not match the current number. This information was acquired through Ancestory.com (subscription required). For any enumeration district, they provide the actual images of the census sheets (100 names to a sheet). In addition, a transcription of the data for each person listed is provided. For each sheet, I download this transcribed data and then added the street name and house number to this data by entering what was listed on the image of that sheet. All of this data was entered into to a spread sheet. This is the source of the Raw Census data for 1920 and 1930. Since this information was entered mostly in whatever route the census taker walked the neighborhood, the data was not in a strict street-house number order. To accomplish that , I imported that information into a database so as to be able to order it, first by street, then second by house number. This is the source of the ordered census data. If you wish to see the actual data on microfilm, you may use the source information available at end of each image section to view the page at any library possessing census microfilms, including the downtown Tampa/Hillsborough county Library. In the Florida censuses, it was sometimes difficult to determine the owner of the house when several names were associated with the address. Burgert Brothers Dated Photos of Our Area. Approximately 150 photos, mostly in the 1920s, of houses in our neighborhood. Dates Stamped in Concrete There is one final source of useful information. That is the dates that are stamped on some driveways, driveway aprons and walkways up to the houses. Dates stamped in Driveways, etc. Our Oldest House - 850 Newport. The William Morrison house at 850 S Newport Avenue was built in 1880 on land purchased in 1878. The Sunland Tribune of September 23, 1880 contains an article in the second column of page 3 describing the construction of the house. Click here to see this paper.